The lightweight yet robust low-level Self Erecting Tower is easy to operate and offers three platform heights of 0.55m, 1m and 2m. 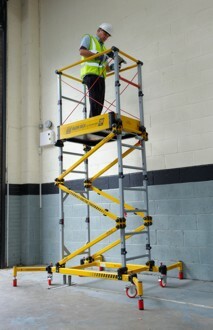 This tower can be fully erected in seconds from its flat pack stowed position offering a stable work platform. The unit is easy to erect, manoeuvre and transport.